Peter started life at Newton Fallowell back in 2011 in his home town of Bourne and since then has progressed to through the industry to now be a Director at the Oakham office. 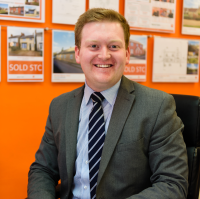 Bringing with him a wealth of knowledge and experience, Peter oversees the day to day business and prides himself in ensuring we have gone the extra mile to assist our clients which regularly results in some superb customer reviews. A former rugby player, his work keeps him at the touch line these days, and he also enjoys socialising with friends and village pubs with a local real ale.